NILAI, 27 November 2018 – A total of 2,712 graduands awarded their respective degrees at various levels for the 16th USIM Convocation Ceremony held on 27–29 November 2018. The Convocation Ceremony Opening Session officiated by DYMM Tunku Ampuan Besar Negeri Sembilan Darul Khusus, Tuanku Aishah Rohani binti Almarhum Tengku Besar Mahmud as the USIM Chancellor at the Dewan Tuanku Canselor. The breakdown of the recipients are as follows: 113 Doctor of Philosophy recipients (23.9%); 119 Master recipients (-2.5%); 101 Diploma recipients (3.6%) and 2,379 Bachelor Degree recipients (4.8%). 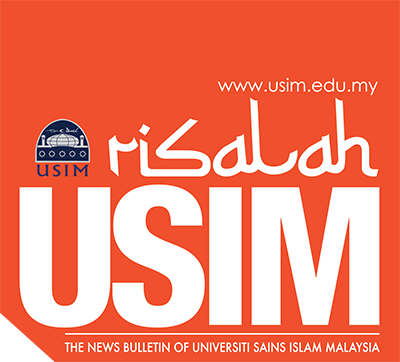 This means that USIM produced its record number of PhD graduates this year, increasing from 86 graduates last year. The PhD graduands originate from 15 countries which are Malaysia, Algeria, Bahrain, Egypt, Brunei, Indonesia, Iraq, Jordan, Libya, Nigeria, Oman, Sudan, Syria, UAE and Yemen. The most number of PhD graduands came from Libya with 38 graduands, followed by Malaysia with 20 graduands. The Convocation Ceremony this year introduces the “Sustainable Development” theme. Sustainable development is emphasised in Islam as it relates to human’s relationships with the environment from the aspect of tawhid (monotheism), observing the signs of Allah’s power and the responsibility of being the caliph who governed the affairs of the world. In addition, it also relates to being responsible, just, and maintaining the balance of the environment (mizan) in order to benefit the life of this world and the hereafter. The Sustainable Development Concept is unique as it brings blessings to the whole world including humans, animals and the environment. Realising the importance of this, USIM chose to espouse the “Sustainable Development” theme for the 16th Convocation Ceremony this year. Nurnadiana binti Ramlee, Bachelor of Science with Honours (Actuarial Science and Risk Management) (FST) from Johor. She was confirmed to have succumbed to chronic viral infections in the skin and internal organs while undergoing the Industrial Training on 9 April 2018. Sahadah binti Ajik, Bachelor of Fiqh and Fatwa with Honours (FSU) from Sabah. She had suffered a chronic disease, end-stage renal failure since September 2016 and had been undergoing a type of self-dialysis called peritoneal dialysis (CAPD) to replace the chronic failure of her kidneys. She passed away on 10 February 2018, after reporting for her Industrial Training at the Kota Belud Syariah Lower Court in Sabah. the USIM Convocation Ceremony also recognised three figures who have made great contributions to the academic world, higher education and community. Two of them been awarded the honorary degree of Doctor of Philosophy and one an honorary Master’s degree. Tan Sri Abdul Wahid Omar was the Group Chairman of Permodalan Nasional Berhad. He was appointed to the position following the completion of his term as a Senator and Minister in the Prime Minister’s Department in charge of Economic Planning from June 2013 to June 2016. Before that, Tan Sri Abdul Wahid was the President and CEO of Maybank, the biggest banking group in Malaysia and one of the largest regional banking groups in Southeast Asia, from Mei 2008. He had also held the position of Chairman of the Association of Banks in Malaysia. He is a Fellow of the Association of Chartered Certified Accountants (ACCA, UK), a member of the Institute of Chartered Accountants in England & Wales (ICAEW) and a member of the Malaysian Institute of Accountants (MIA). Prof. Dato’ Dr. Muhammad Muda was USIM’s second Vice-Chancellor (2009-2012) who replaced Prof. Emeritus Tan Sri Dato’ Dr. Abdul Shukor Hj Husin, USIM development pioneer ‘architect’ for 10 years. Dato’ Muhamad Muda started his career in USIM as the Dean of Faculty of Economics and Muamalat from 2001 until 2007. He was instrumental in the establishment of the faculty and in pioneering the offering of the Economics and Muamalat programme. Afterwards, he was appointed as the Deputy Vice-Chancellor (Academic and International). As USIM’s second Vice-Chancellor, he has put forward the focus and objective to ensure that USIM becomes a leading edge science institution with Islamic studies as its core. Tuan Haji Mohd Alwi Yusoff is a holder of Shariah Master’s Degree from Al-Azhar University, Egypt. He was the person responsible in consolidating the establishment of the Faculty of Quranic and Sunnah Studies (FPQS) when USIM was first founded. He started his career in USIM in 2000 as a lecturer in the Faculty of Shariah and Law. In 2001, he was appointed as the Acting Dean of FPQS until 2004. Ending his service with the university in 2007, he went on to serve as the Dean of Foundation Studies at Al-Madinah International University. He has held positions such as Chairman of the Board of Directors, Koperasi Majlis Guru-Guru Agama Sekolah-Sekolah Menengah (Koperasi MGU), Kelantan; Member of the Board of Trustees, Yayasan Guru Malaysia Berhad (YGMB); Member of the Board of Directors, YGMB-ASHA Holiday Sdn. Bhd; Member of Majlis Agama Islam Wilayah Persekutuan and Chairman of the Administrative Advisory Council, Institut Kemahiran Baitulmal Wilayah Persekutuan. As in every Convocation Ceremony, a few students singled out for their outstanding performance over their peers and are given awards. Two of the excellent graduands received the Anugerah Pelajaran DiRaja (Pingat Jaya Cemerlang), another two the Anugerah Canselor and another one the Pingat Emas Naib Canselor. Besides these, other awards are also given out the chosen graduands including, for the first time this year, Anugerah Khas Daya Cemerlang. The USIM Convocation Ceremony also enlivened by the hosting of USIM Convocation Festival at the Convocation Festival Site next to the Dewan Tuanku Canselor. The Convocation Festival started earlier from 24 until 29 November 2018. Helmed by the USIM Student Representative Council, plenty of activities was prepared for visitors such as a scholarly forum, humanity music night, sports carnival, sales booth and the Nocturnal Run 3.0 was held on the night of November 24th and feature YAM Tunku Besar Seri Menanti, Tunku Ali Redhauddin Ibni Tuanku Muhriz, USIM Pro-Chancellors and the University Management.